Christine brings many years of accounting and cash management experience to Propane Resources. Born in Germany and moved to Kansas City at the age of 4. Christine has been married to Jake for 21 years. Together they run The Kansas Bee Company / MO-KAN Honey. Currently Chris and Jake have Charlie (the cat) and many bees to tend to! 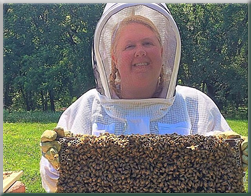 She spends her time with their bees and also enjoys cooking and antiques.